Little Rocky Road Mountain Chalet - is a beautiful two bedroom luxury chalet located surrounded by gum trees and the sounds of wildlife at Crackenback. Your mountain home decorated in a modern and functional way has a warming gas fireplace in the lounge. Perfect for those cool summer evenings in the mountains. You have a media room with large screen to watch some sport or a movie after a days activities. The two bathroom's are stocked with oversized super soft towels, designer toiletries. There is no WiFi but you can order 22gb with a Telstra 4g modem supplied that you can connect up to 5 devices. Alternatively your own data can be used. As a guest, there is access to all the fantastic facilities at the Resort - tennis, canoeing, paddle boarding, golf, indoor swimming pool, archery, and Segways and mountain bikes for hire. You are on the gateway to great mountain biking trails with the 17klm Thredbo Valley Track winding its way besides the Thredbo River from Thredbo to Crackenback. This is also a shared trail for a hike or use Thredbo as your starting point to climb Australia's highest peak and one of the Worlds 7 Peaks! There are two restaurants onsite. 'Cuisine' boasts inspiring views of the Lake at Crackenback and mountains beyond. It offers authentic flavour incorporating produce from the local region. Head chef is the world renowned Jean-Michel Gerst. Alpine Larder, the second restaurant, is more casual dinning with wood fired pizza and pasta dishes. Hop into the car for a short drive to the Wild Brumby where you can have a 'Schnappy Tasting' and a great ploughmans lunch. Try the butterscotch schnapps! Crackenback Farm is also a favourite of ours for dinner. Run by renowned foodie Len Evan's daughter and son. It is well worth a special dinner with their modern farm style French set menu and matching wines. Ray White are the best to deal with! Great location with amazing views. Beds super comfy and house well appointed. Two great restaurants within walking distance. Kitchen has everything and I recommend doing a food shop in Jindabyne before you go to the house. Will be back to stay again. Peter - you are delightful to deal with and your daughter on reception was great. Her welcome bag was very helpful. Please let her know we really appreciated it. Lovely place. Needs new carpet downstairs but for a rental it is clean, functional and we will 100% be back to stay soon. Perfect for a mid-week summer getaway in the Snowy Mountains. 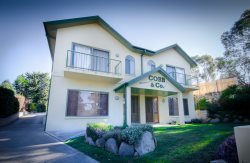 Great home in a great location close to both Thredbo & Perisher. We loved staying here & will definitely return for more of the same! Peter and the team were extremely helpful. Very communicative & accommodating. A pleasure to deal with! The staff at Ray White Jindabyne were very welcoming. Fantastic house with awesome views. Lots of things to do in the area - we didn't get in the car once during our 5 day stay. The house included lots of little things that made your stay better - wraps and cooking oil in the kitchen for example; a wide range of up-to-date DVDs and books in the living area is another example. It was wonderful. And having access to all the fantastic facilities at the Resort is a bonus - tennis, canoeing, paddle boarding, golf, indoor swimming pool, archery, and segways and mountain bikes for hire. A non-stop (or relaxing) destination.